'To love the lines on a map is to love a symbol,' says Aakar Patel. How many ways can you love your country? Actually being Indian is the first way, by which I mean holding an Indian passport. In my case, three passports. This is because Indians are required to get advance visas for most countries, and I travel a lot. So I have to carry with me two expired passports which have long term valid visas. I have never really worked outside India much, but I know there are some Indians who have kept their passports even though their entire working life has been spent abroad. The music conductor Zubin Mehta is one such person. Amnesty International's Secretary General in London, Salil Shetty, is another. Mehta for many years led the New York Philharmonic and was the only member of the group required to queue up for a visa when they travelled but he chose to retain his Indian passport. The second way that India can be loved is by loving Indians. I mean all Indians. Those of your faith but also those of different faith and different caste and different language. Those with whom you agree and equally those with whom you do not. Those who eat meat, of any sort, and those who do not. To love all Indians is to love India in reality. To love the lines on a map is to love a symbol. The third way to love your country is to learn its languages, as many as you can. 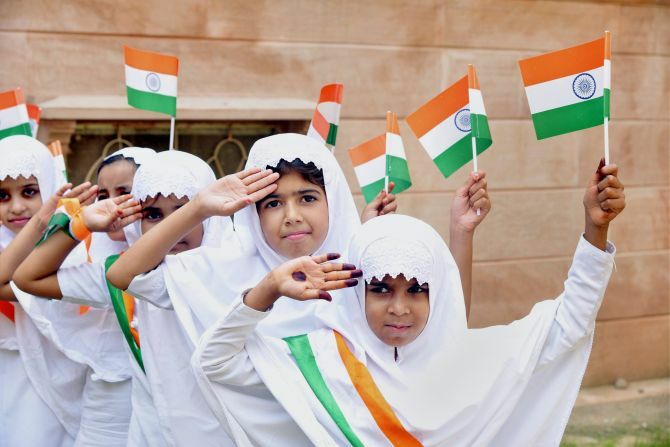 Gandhi said all Indians must learn Hindustani in both the Devanagari and Perso-Arabic script. I have taught myself to do both, but I do not agree that all Indians should learn Hindustani. The fourth way to love India is to understand its classical music and its poetry. This comes mostly in adulthood because Hindustani music is mature and its mood is not joyous but melancholic. It is not possible to truly understand this country and its people if one does not understand what Khayal and Carnatic are and why they are rendered in the way that they are, with the singers' eyes closed. I know many poems by heart, like Shelley's Ozymandias, but the one that moves me most every time I read or listen to it is Nag daman, by Narsinh Mehta (who wrote Gandhi's favourite song Vaishnav Jan). Nag daman is about how the boy Krishna battles the snake Kalia but does not kill him. It does not embarrass me to say that I am often moved to tears when I hear this poem, especially when it is set to simple music. The fifth way to love India is to love its food. This is not to say that you must hate the food of others. I am open and some years ago on a visit to Vietnam, I ate snake and dog on the same day in Hanoi. I enjoy Japanese food a lot, but the food I prefer is Indian. Above all I like the food of the peasant Patidar, which is a thick bajra roti (called Rotlo in Gujarati) and a vegetable with some garlic chutney. I eat it most days for lunch and I could eat that every day for the rest of my life. The sixth way to love your country is to read and know its Constitution. India has one of the longest Constitutions in the world but what I mean is knowing the opening bits, the Preamble and what it signifies, and what the Fundamental Rights promised to us actually mean. It is one of the greatest documents on earth and should be absorbed by more Indian citizens. The seventh way is to honour those who serve. To me the teacher is more important than the sportsman. The sporting victory promotes a nationalism that is hollow and one that inevitably wanes. I do not hate sportsmen, but I do not hold their contribution as being of any great significance. The eighth way I love India is by paying my taxes. I do not take any pride in doing this because it is what I have to do. But most Indians do not pay their income tax. Of these, most are not required to because they are either poor or they are exempt. I am not referring to them. I ask those Indians of the upper class and middle class who cheat on their taxes: Do you love India? You will say yes. I say no. The ninth way to love your country is by empathising with its people. To feel the pain of the marginalised and the weak. To be hurt when Dalits are hurt, to be humiliated when Adivasis are humiliated, to feel ashamed when Muslims are persecuted, as they often are in our country. This empathy is the same sentiment as loving India. The last way in which we can love our country is to be open to its contradictions and its differences. Imposing a uniformity on such a vast place, whether a uniformity of language, of religion, or of personal law, of food preferences, or of music, is to me to not love this country in whole. These to me are the principal ways we can love our country. To me, everything else is incidental. You may disagree with and perhaps dislike this view and even hate me for it. But I will love you just the same.